Collar and leash in one for convenient off-leash dog walks and swims. Leash is made from ultra strong Spectra (Kevlar) cord that retracts into the collar. Great collar. Training a new baby and you want to try off leash while training. Collar is right there for redirecting, comfortable and stops me from always carrying a leash in hand or around neck. This is the best collar with the leash. Not having To go back in the house to get a leash. But having all in one! Should have named her Houdini! I have a pound hound, that is a master at escaping out the door when anyone comes by. I keep this on her at all times, and before opening the door, I can grasp leash to avoid any attempts by her to scoot out the door! What’s better than leash-free play for your favorite pooch? Not having to carry the leash once your dog is running free. Brian Dagnon was sick of carrying an empty leash when he went trail running in the Pacific Northwest with his dog Fletcher. He and his fiancé Paula Johnson came up with the idea for a retractable leash built into a collar, so they could let Fletcher run and swim freely but still have access to a leash when they needed it. The leash had to be strong enough to control large dogs like Fletcher, a 110-pound black lab who likes to chase deer and crows. But it also had to be compact. 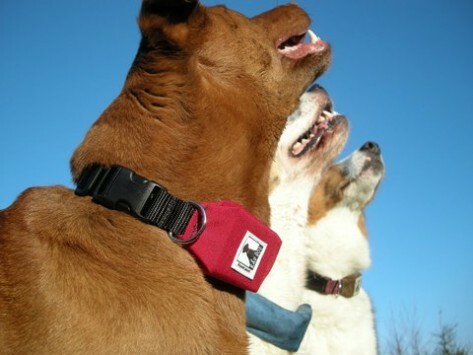 After years of prototyping and many miles of running, Brian and Paula debuted the Release N Run collar. It’s made with Spectra, a lightweight fiber that’s 15 times stronger than steel. Inside there’s a retracting mechanism that was originally designed for scuba gear (so you know it can handle a swim in salt water) and for securing military weapons (so you know it’s reliable). Your best friend deserves to run around without a leash every once in a while. So do you. Get ready to romp unencumbered.